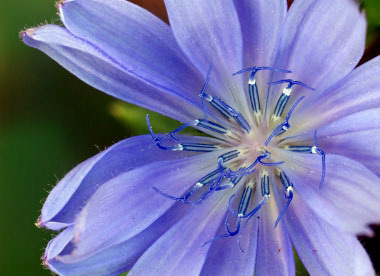 Chicory is a perennial herbaceous plant with a blue or lavender flower. Its leaves are tastiest in the spring and autumn as the summer heat tends to make them taste a little bitter – but they are still edible. Toss them in a salad but before doing so, blanch them. They can be mixed with other greens to minimize their strong flavor. The mature green leaves can be used as a cooked vegetable. 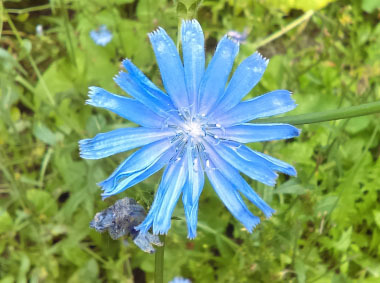 Distinguishing Features: Chicory is a branching, scraggly-looking plant. It often stands out alone in gravel areas, or open weedy fields and the flowers only open on a sunny day. Flowers: The flowers are 2 to 4 cm. wide and are usually a bright, light blue. There are two rows of involucral bracts - the inner are longer and erect, the outer are shorter and spreading. 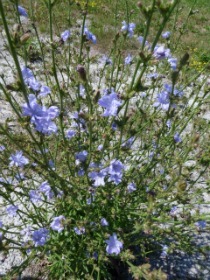 Chicory flowers from July until October. Fields of Nutrition has medicinal benefits and vitamin/mineral content of Chicory. Leaves: At the base leaves resemble dandelion leaves then alternately spaced and much smaller as they get higher up on the stem. 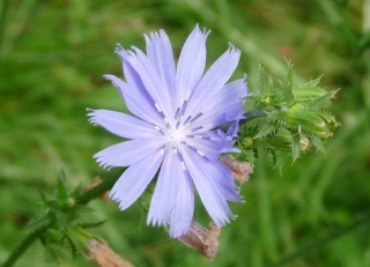 Height: When full grown, chicory can reach heights that vary between 90 and 180 cm. Habitat: Open areas, roadsides, grassy areas near parking lots, and 'weedy' fields all over Ontario and most of Canada and the U.S. Edible parts: Leaves and root. Although the flower is edible, it is very bitter. For more in-depth information (e.g. nutrition, medicinal values, recipes, historical information, harvesting tips, etc.) please check out our Chicory PDF magazine.